Imagine vacationing year-round in this beautifully remodeled home with 125 feet of Clackamas River frontage! Enjoy spectacular VIEWS and total privacy. Situated on a professionally landscaped .59 acre riverfront setting with its own natural pond. Nature lovers will enjoy bald eagles, osprey, salmon and steelhead right outside your door! The peaceful setting is an outdoor paradise for fishermen, bird watchers, walkers and kayakers alike. Walk the scenic path along the river and over the bridge to downtown Oregon City or visit three nearby parks. 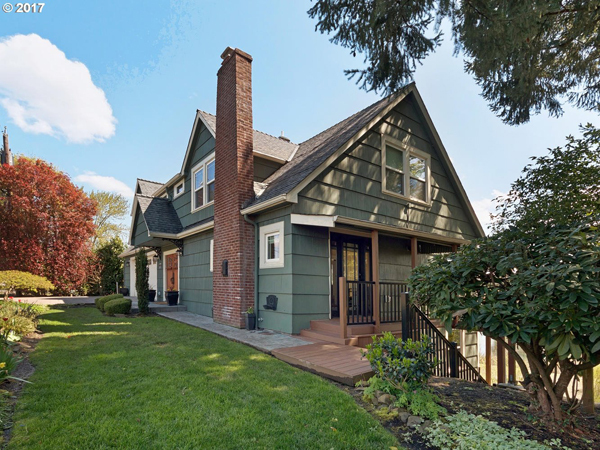 Close to the light rail station and less than a 25 minute drive to downtown Portland. Expansive walls of windows bring the outdoor natural beauty inside. This traditional home has been updated for today’s discriminating buyer featuring five spacious bedrooms and 3.5 baths and a gourmet lover’s kitchen. This home has been recently remodeled with updated mechanicals. The lower daylight level has a second kitchen with a private outside entrance, two bedrooms, full bath, and an amazing family room with fireplace, granite bar and a private, covered deck, making it suitable as a separate living space for extended family or rental. An entertainer’s delight with three new decks overlooking the river view! Private, serene. LOW taxes. Indoor and outdoor living at its finest! A rare find in this wonderful, historic neighborhood.